It's like a new life form isn't it, just beginning to take off. Lovely frame job for this one as well Mariana. So glad you shared this beauty. Just lovely! The colours are superb, the clarity excellent, and the framing so appropriate! 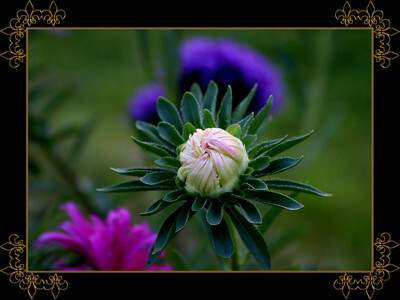 Beautiful Photo of Aster bud, so clear and perfect, but your frame is the nicest yet - so imaginative! Lovely work, Mariana! Thank you for sharing! Fabulous macro shot and great presentation.Nice work, my friend. Love the frame & flower both Mariana! Nice!! Love the frame, Mariana, and the aster is well done, too! WOW!! OK, the bud is amazing, but, that frame works is stunning Mariana!! Excellent posting!! Picture Purrrfect . A purrrfect world is what we all want, but, seems too unobtainable. If I've viewed and commented on your post, and you liked my remarks then NO THANKS is needed...just getting to see your wonderful work is thanks enough for me!! Also BIG thanks to all who check out my work!! I appreciate any and all comments & feedback!! 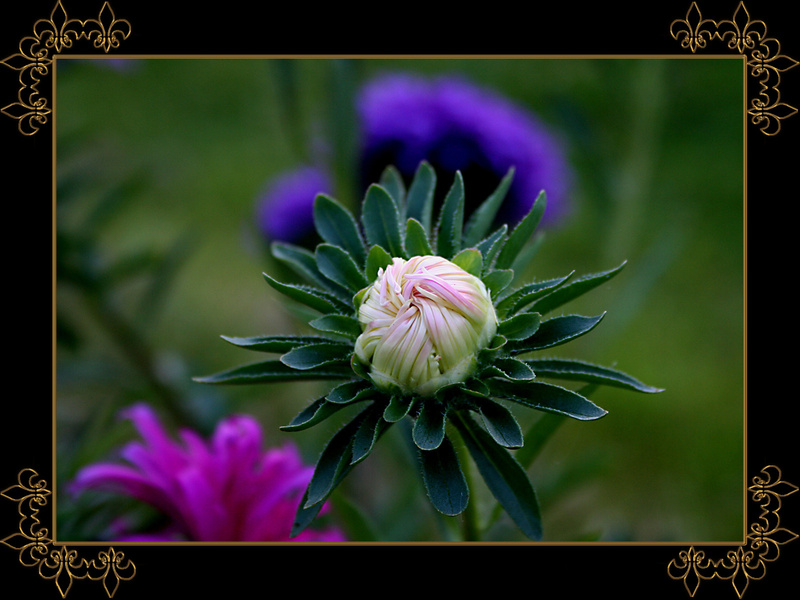 I simply adore both of your aster images beautiful work, Best wishes, Dwight. A beauty and the frame is AWESOME. I gotta fave it. Perfect in every way. The framing is exquisite. I love the framing, Mariana!!!!!!!!!!!!!!!!! You did a great job!!!!!!!!!!!!!!!!!!!!! Ha Ha! I love it when you call me weird! Tell me something I don't know! Go look in my favorites!!!!!!!!!!!!!!!!!!!!!!! Oh, the colors here are terrific. The image is wonderful with the blurred background and I absolutely LOVE the framing! Nice work, Mariana. Absolutely beautiful aster and I love your new framing! How did you do that? Wow! I knew this was yours before I saw your name! Beautiful! Mariana this is beyond words beautiful. Thanks for sharing. Great colours and softness I love it!